Laura is a contributor at YLF and creator of The Houseover. We are near the end of tackling my 10 casual outfit formulas for Mums and gals on the go (refresh your memories with formulas #1, #2, #3, #4, #5, #6 , #7 and #8). Today we bring back super stylish, Chicago forum member Laura, who is a freelance writer and busy Mum on the go. Frock gal Laura was intrigued by knit pants as an alternative to jeans and this is how she put together her look. Because of my body type (hourglass tending toward pear), I find it most flattering to wear my knit pants with a good amount of coverage, with a top that hits at mid-thigh. And, because the pants are knit, I prefer to wear a woven top. The one exception to my woven preference is my grey, a-line turtleneck sweater tunic, which I accessorize with loads of long chains. I love that look with the pants, and it’s the ultimate in coziness on a cold winter day. These pants have become my winter replacement for the leggings I wore to death in spring and fall. Angie encouraged me to be creative with the formula, so I paired the pants with dresses, tunics, cascading cardigans, and added a coat at times for extra coverage. Angie’s formula calls for a belted tunic shirt, and although I do wear a tunic shirt with Ponte knit pants, my shirt doesn’t work with a belt, so you won’t see one pictured here. Unlike formula #3 (casual dresstights or hose + tall boots), which I road tested and found very straightforward, you may need to do some experimentation. And remember, you can always post your outfits on the forum for feedback. When looking for a woven tunic or dress, try patterns and color. Plaid is big this season, in reds and blues and taupes and grays, and I found myself drawn to berry reds and grey. But, I have also paired the pants with a ruffled chiffon dress, and by adding a casual sweater coat, found the pants took the dress from formal to casual, giving me more opportunities to wear it. Tall black boots play a big role in making this look work. I love the long, lean line they create. Riding boots or my waterproof patent leather La Canadiennes are my favorites. Try booties as well, especially if you’re in a warmer climate. The red booties are a fun alternative that provide a pop of color. Handbags? Well, although my kids are out of diapers, I still find that a roomy bag suits my MOTG needs best. I usually go for a casual, hobo-style bag. My go-to handbag of the moment is from Ecco, and has a pretty bluish silver metallic finish. 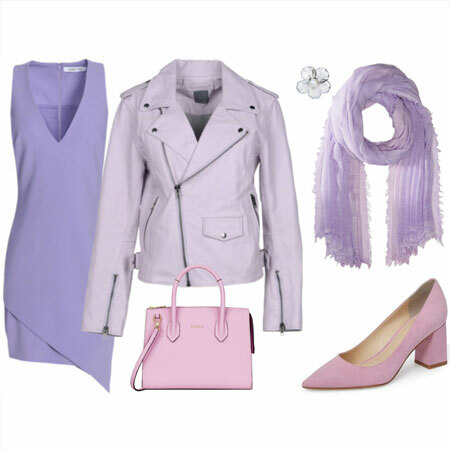 It goes with everything in my color palette! Ladies, over to you. Are you wearing formula #9? Have you changed it up to suit your preferences? Let’s hear from you! Very pretty, Laura! You look casual and trendy, comfy and fashion forward! My favourite is the picture on the very right with the adorable patent boots – great! Unfortunately I can´t find ponte knit pants here in Europe and I don´t see anybody wearing them – what a pity! Wonderful, inspiring article and photos, Laura. I have yet to sport this look but want to try it after seeing your examples. Really, Phoebe? That’s interesting. There are plenty of Ponte pants here in the US. You’ll have to fly over for a shopping spree. It’s a great casual alternative to jeans. Thanks for another excellent write-up, Laura! You really got into your style groove with this formula as I know it was a bit of a challenge in the beginning. Black pants are hard to match up with tops when most of the tops in stores are black and grey too. One feels blah fast. But well done! Each outfit is fabulous and texturally interesting! Love your little blonde tag along, and you yourself are going blonder too I see. Very pretty. I wonder what Laura’s Mom is going to say about your Ponte and plaid uniform……. Laura you look fantastic in those outfits, very well put together but definitely still able to run like a mom should! I have been reluctant to get these pants because I wasn’t sure how structured knit pants COULD be, and I like to have some structure on my bottom half. Tights, which I do love, I wear with dresses and skirts almost always because I own very few tunic tops to provide coverage over the rear and thighs. Are these instead TOO thick to be worn under skirts or dresses? Laura, you look fantastic. I especially love the berry color in the right-hand picture and your boots are just perfect. Beeeyoutiful! Love the looks, thanks for the write-up. My particular favorite is the grey sweater, moto jacket, and chains. I’m definitely moving these pants up on my wish list. Palmfronds, I’ll be interested to see what others say about the structure of these pants. I was thinking they’d be more like a straight pant that skims the leg, but my first thought upon trying them on was that they fit much like riding jodphurs do. PalmFronds, you bring up a good point. Personally I am still on the woven pants bandwagon. BUT! I did find a WOVEN Ponte knit pant alternative that achieves the same look. They are structured black cigarette pants made of a rayon cotton spandex blend with just the tiniest bit of sheen. They are heavenly to wear. So, so comfy. I wear them both casually, smart casually and for business casual purposes. Beth, you may need to try on a few before you’re happy with the look and fit. The thicker the fabric the more structured they will feel against your body. Ponte pants have been a revelation for many of my clients, though. I’m grateful for the trend. Those pants you describe sound great aside from the shape. All cigarette pants I have tried are deadly on my shape, too much curve on the lower half! You look great Laura. I would wear these plaid tunics if I could find them. Where did you get yours? You seem to always tackled the styles you try. You are fearless, in a very feminine way. Your little blonde boy is so cute! Is this a picture of the same boy or your 2 boys? Wow, Laura, you look wonderful. I too love my ponte pants. I wear leggings also, but find that with leggings I need more coverage in the rear. With the ponte pants, I still like to wear long tops, but they don’t need to be as long as what I’d wear with a legging. The structure of the ponte pants eliminates the need for me to cover as fully. Therefore, it’s a more versatile piece of my wardrobe. These are definitely my go to pants! Mine are made of polyester, rayon and spandex and I found them at Marshalls for a steal!! Hi guys – thanks for all the very sweet compliments — they are hugely appreciated, as this formula was a big challenge. Kknit pants are tricky with my body type, as they could seem bulky and emphasize the bottom half, which is not what I want to do! San, those plaid tunics are all from Max Studio. They have a good range of woven plaid and patterned tunics and dresses at the moment. The little blonde model who keeps me smiling is my 3-year-old. Quite a ham! Lovely illustration of this formula Laura and your son looks so angelic. Phoebe do you have access to Marks and Spencer in your part of Europe, the website has all types of ponte trouser silhouettes. Since you’re a mom (as am I) I hope I can ask you this straightforward question – do you feel like you’re wearing maternity tops when you wear tunics? I do. It’s kept me from embracing the trend. I do NOT want to be asked when I’m due! I have to agree with Phoebe, I’ve still to see my first pair of Ponte knit pants over here too. It’s a shame really, I’ve been wanting to try them ever since I first read about them on YLF, and after seeing your fabulous outfits now Laura, I want to even more!! Edit: I just realised that I do own a pair of Ponte knit leggings (which I’ve been wearing constantly), but “real” pants would be a little dressier I think. Something I’d love to try. I just know they would be sooo comfortable. Mamark, I get your comment completely. In my experience, most people’s eyes have adjusted to empire waists and trapeze tops (the grey turtleneck fits in that category). But, if you want to go another direction, remember that the top on the far left is also a tunic, and it has a waistband, and that some shorter dresses can be worn as tunics (like the berry plaid dress, far right). Inge and all the Europeans, I hope ponte knit pants find their way across the Atlantic. And yes, Inge, you are very astute, I am growing my hair out, although my “longer” hair is still very short hair to most! 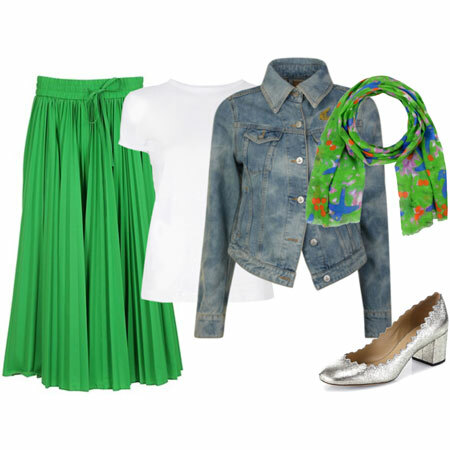 I have been also wearing this look, mostly with a tunic ( one of them is a blue/grey plaid shirtdress). I did try once and wore my ponte pants like regular pants, with a longish ( but not tunic-length) sweater and felt fine. My only issue with these pants is the quality. I have the INC ones and after two washes they have already started to pill! Plus the smallest size is a bit too big for me. I figure these issues would be solved if I went for a higher priced, premium pair, but right now I am still not completely sure how much use I will get out of them. Laura you look amazing! I Glad the pants are working so well for you! Even in winter I think they may be too warm for Australia, but it’ll be interesting to see if they come out over here or not. Love your biker vests over the tunic – great look!! See, this is the look I always picture you in when I think of you, Laura; it’s a perfect blend of casual, edgy and just plain FAB that is so you! I love how you really work those plaid and patterned tops with the ponte pants or leggings. Hey, is your hair blonder?! It looks terrific! You can take me shopping for this look when we go in January, because you have got it DOWN. Tall boots look chic and classy. The little boy is beyond adorable. You are such a stylish MOTG. It really helps me to see your outfits and know that they work for this lifestyle. 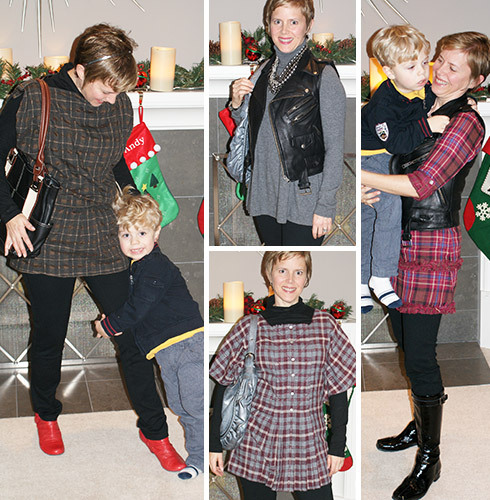 My favorite outfit is the red plaid tunic and patent boots. Just back from Denver where it was ever so cold and snowy…could’ve used the Ponte Knit Pants! All the comments were terrific, but here’s one more: #9 is a totally updated, comfy, and practical style. You look wonderful, daughter dear!